This is a good example of a company using dubious advertising practices to advertise a product or service. Back in 2013, CommunityCPS (now Beyond Bank) developed and released and fairly mediocre iPhone app. It was bashed a lot because it was essentially nothing more than a little web app with a lame interface. Pressing the “Home” button thinking it went home basically logged you out completely without a warning. It was really annoying and I’m not being mean about this, I know someone probably worked really hard coding this up, but after you’ve used the ANZ app (or most other banks), you cannot really go back, it’s like Samsung with the iPhone, everything else should just copy it, even if a massive lawsuit ensues. “The most frustrating app I have used. Has almost no functions doesn’t remember client numbers. Takes for ever just to see balances. Better using the main website on sarafi.(sic)”. “Makes me want to change to a different bank”. So there are a few, like me, who suggest CPS look at the ANZ app and borrow off of their design principles. It’s all well and good that the app was ‘horrible’ but almost as soon as it was released, there was a magazine calling the app ‘nifty’. I was dubious about this as soon as I read it so I clicked on the image. So, no reference to what the ‘nerd magazine’ is or where they got the tag ‘nifty’ from, it was all rather unusual. Why would a company get a rating of ‘nifty’ (whatever that means) from a magazine and not reference the article or magazine in question? Especially considering the app was not nifty. Well, I decided eventually to email them after looking for a ‘nerd magazine’ somewhere on the interweb and only finding reference so some other language nerd magazine. In my email I stated that I could not find any reference to the magazine anywhere and that I was interested in who called this app (which was horrible to use), nifty. Once emailing them and letting them know, the response was quick. 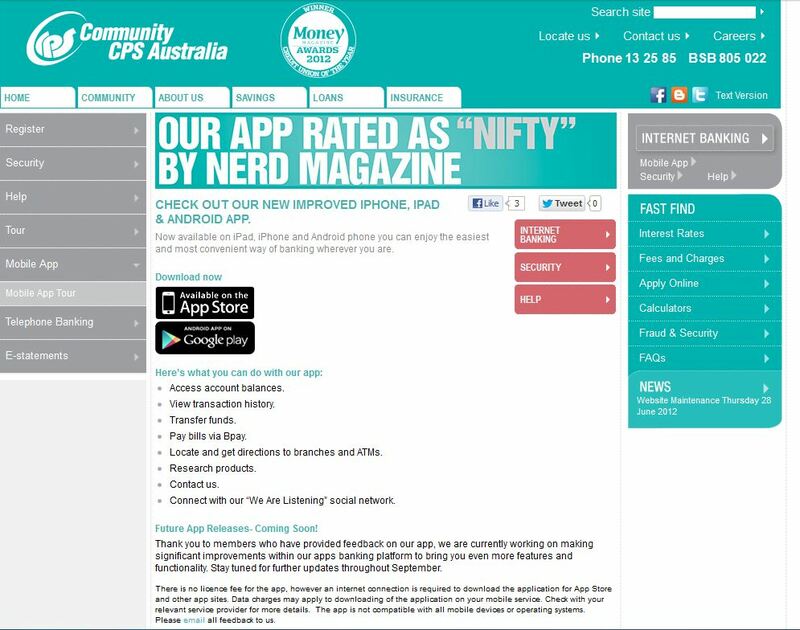 Within 1 hour, all references to the app being ‘nifty’ and nerd magazine were removed from the website. So basically, the ‘nerd magazine’ doesn’t exist. No publication or magazine EVER endorsed this app or said it was ‘nifty’. 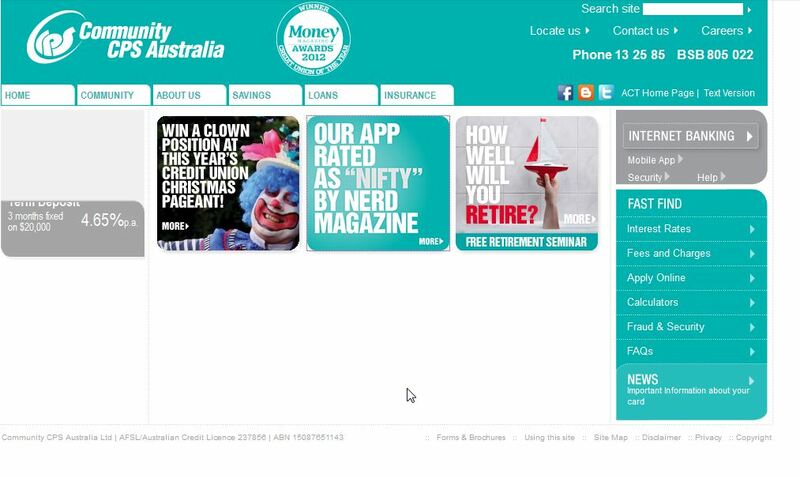 Out of all of the IT magazines in Australia (and there are a lot) not one could be available to test and endorse the app, not even to call it ‘nifty’. I commend CPS for their quick response to removing the offending references to their app as being ‘nifty’ by a mythical magazine however hopefully next time they will not put up such false information. Update: CommunityCPS is now called Beyond Bank. Theme Designed by InkHive. © 2019 David's Blog. All Rights Reserved.